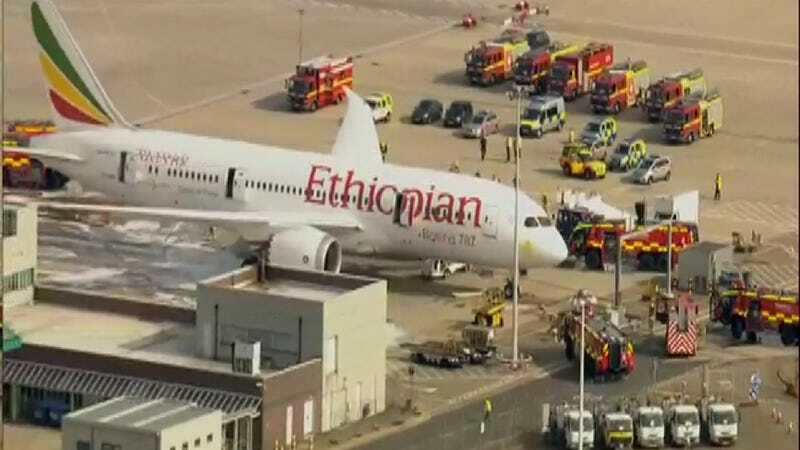 More bad news today for Boeing's troubled "Dream Plane" as an Ethiopian Airlines 787 jet caught fire at London's Heathrow Airport, according to reports. Thankfully, no passengers were onboard. The BBC reports that arrivals and departures have been suspended for the time being. Photos on Twitter show the plane close to a terminal surrounded by firefighting vehicles. It's terrible news for Boeing. This particular plane, according to the BBC, was the first 787 to fly back in April after the planes were ordered grounded due to battery malfunctions. That order happened following a 787 fire at Boston's Logan Airport in January. In the immediate aftermath of today's incident, Boeing stock plummeted sharply, according to the Wall Street Journal.